Choose from a 10K course or a 5K course. 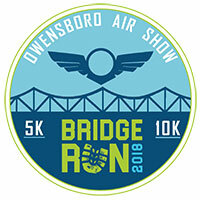 Both start on the Owensboro riverfront, cross the Blue Bridge into Indiana, then turn around and return to the start/finish line. You get two trips across the bridge! UPDATE – The 10K starts at 7:15am, the 5K starts at 7:30am. The Blue Bridge will close to vehicle traffic at 7am. Early registration is $15 for the 5K and $20 for the 10K. Packet pickup will be Friday from 2p-6p and Legend’s in Owensboro (325 Park Plaza Dr). Any bibs not picked up Friday can be claimed before the race on Saturday, but be sure to allow yourself enough time to make the start. Part of the Owensboro Air Show weekend.